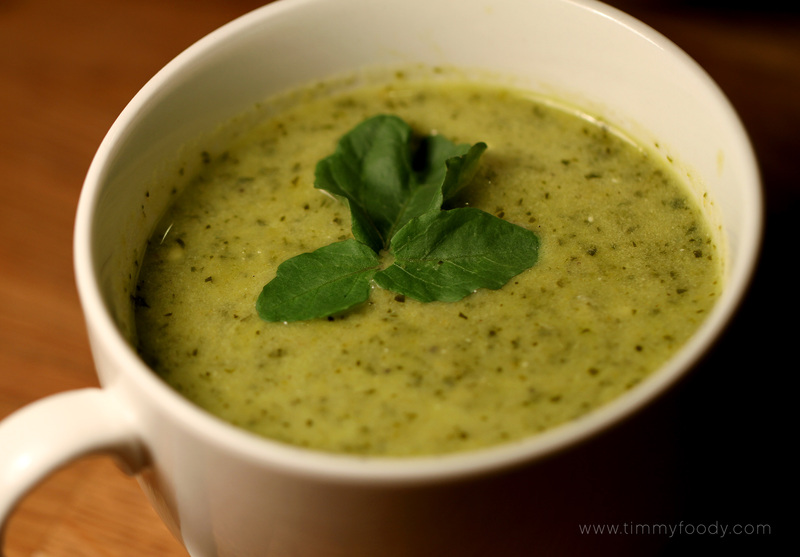 Ok so this evening I had to figure out what to do with the vat of Watercress soup I made yesterday. As it’s currently hotter than the Sun in Sydney I didn’t really fancy soup again. Instead I thought some sort of Bangers and Mash with Watercress sauce instead of gravy would be much better for a hot summer’s evening……..I don’t know what I was thinking. Anyway, I’m not really writing about that as it worked ok but it didn’t really shoot very well. It just came out looking a bit sloppy. It did however lead me to taking my watercress soup from good to amazing. So what need to do is to make the soup recipe from yesterday here and then do the following. 1. Once the soup has been blended. Take out enough to feed the required amount of people and put in a smaller pan. The following is enough for 2 people. Now add a tablespoon of sour cream. A good handful of freshly grated parmesan and a tablespoon of the mash potato. Mix well. It will lighten slightly and thicken. Taste and add some more black pepper. (I have a major black pepper addiction so how much you add is up to you). If you’re cooking for more people then increase the quantities of everything. Ok so onto the Juice! While I was waiting for this to cook I decided to train. Again a massive error considering how hot it was. When I was done I needed some protein, something sweet, and preferably something nutritious and refreshing. So I decided on a juice. It was a bit of an experiment but it worked pretty well with a bit of tweaking. 1 large lemon – with the peel removed. The first taste was a really bitter and a bit of a kapow in the face. It kind of made your face screw up like a 90 year old man who’s just sucked on a lemon. I had up to that point only added 3 apples and no lemon. It needed a bit more sweetness so I added one more apple and the lemon. It balanced out nicely. It still is slightly bitter and it does have a peppery kick from the Watercress but it’s very drinkable. And very good for you. I was thinking about adding a handful of strawberries to add a touch more sweetness, but if you can handle the slight bitterness then I’d leave it as is. I was also thinking about adding some ginger. It might compliment the pepperiness of the watercress. I’ll try it next time and report back. Good night one and all. 10.30pm and about 25 degrees in Sydney right now……bah!